separated by a dash. On mobile, the combined headline fields may wrap to a second line. Both headlines contain 30 characters each, more than standard text ads. Double-width characters such as Chinese, Japanese, and Korean allow for 15 characters. 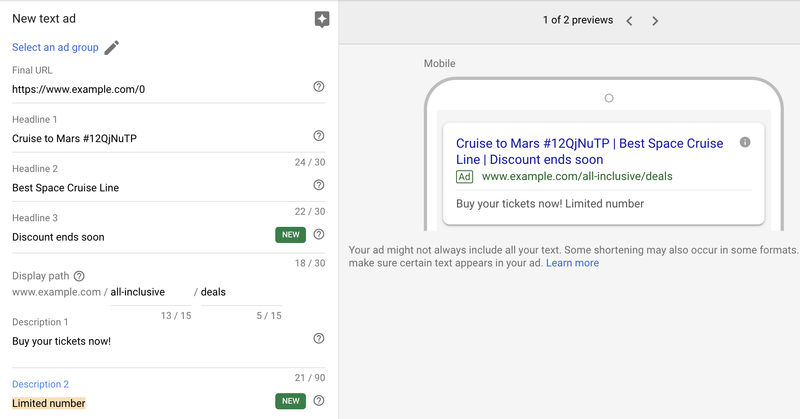 Here's an example ad for Interplanetary Cruises in the AdWords user interface, after being uploaded via the AdWords API. The new Google Ad format will have two longer headlines of up to 30 characters each and a longer description line of up to 80 characters now in India. The display URL can include up to two directory paths that advertisers can use to describe the landing page content. The paths do not have to match the landing page URL. 0 Response to "Official: Google to roll out Expanded Text Ads for all devices in India"